Days of Our Lives Recap: Ben's DESPERATE To Find Ciara! Days of Our Lives Recap: Ben’s DESPERATE To Find Ciara! The Days of Our Lives recap for Tuesday, February 5 features Ben standing up to Hope as he tells her they MUST find Ciara! And, then he seems like he’ll do whatever he can to make that happen. Hope (Kristian Alfonso) accused Ben (Robert Scott Wilson) of kidnapping Ciara and he said to her to lock him up if she’s sure but there was no evidence. Hope threatened him and left as she continued to work with Ted (Gilles Marini) to find her. As Ben wondered where Ciara was and even tries to call her, Ted wondered if Hope was wrong about Ben. Ciara (Victoria Konefal) begged Jordan (Chrishell Hartley) to help her escape but she refused, claiming she’s protecting her. Ciara realized it was Jordan who kidnapped her as Jordan admitted only she can deal with Ben. Julie (Susan Seaforth Hayes) tried to get Abby (Kate Mansi) to forgive Chad. Abby told her about his offer to quit DiMera and Julie wondered why they haven’t reunited. After Julie left, Abby was surprised to find Jordan at her door! 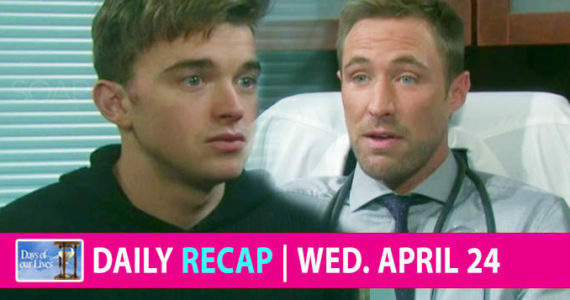 Chad (Billy Flynn) updated Kate on what was going on with Stefan, but also tried to throw her out. She warned him if he quit and Abby doesn’t forgive him, he’ll have nothing. She told him DiMera is his legacy to fight for — and then both were disappointed to learn Stefan survived after being shot at Doug’s Place. Lani (Sal Stowers) and Eli (Lamon Archey) were interrupted by a phone call and they were shocked to hear Stefan got shot trying to save Chloe. As for Chloe, she sent her kids to be with her mom to keep them safe. She was also quite grateful to Stefan.